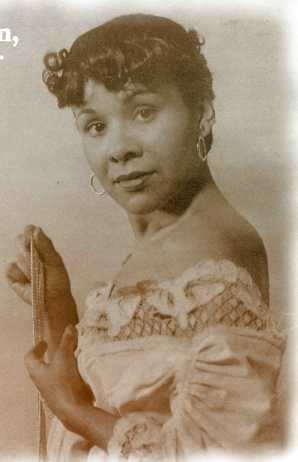 At Joliet Township High School (JTHS) back in 1926, Katherine Dunham was known as "Kitten." Sixty years later, the New York Times called her a "Controversial Pioneer." The journey that took Dunham from a shy, sixteen-year-old graduate of JTHS to being a world-renowned dancer, choreographer, anthropologist, author, and humanitarian is both fascinating and inspirational. Katherine Dunham listed her birthplace as Chicago, but there is reason to believe she actually was born in Glen Ellyn. In a 1986 interview, however, she claimed her birthplace as Joliet, Illinois, in 1910. That date is a bit slippery also. Not that it matters; Dunham's body of work in so many fields is timeless. Dunham's mother, who was twenty years older than her husband, died when Katherine was about four years old. For the next couple of years, she was cared for by various relatives in various places; she did not settle again into a traditional family life until about 1916, when her father, Albert Millard Dunham remarried, gathered Katherine and Albert Jr., and his new wife, and moved to Joliet. Albert Sr. established the family in a few rooms about the West Side Hfleaners and Dyers shop he operated Ion Bluff Street, in the building known "Merchants' Row." Father and son struggled with out-dated equipment and ancient delivery trucks while Antoinette Poindexter Dunham attended to the tailoring and repair end of the business. Little Katherine dreamed of places she would go and things she would do. Eventually, she did them. Both children attended Broadway School, later attending Joliet Township High School and Joliet junior College. Upon graduation from Joliet Junior College, Dunham took a position in a branch library in Chicago and began teaching classes at the University of Chicago. Her first public appearance as a dancer came at the Chicago World's Fair in 1934. Joliet audiences had the privilege of enjoying her talents much earlier, both at school functions and at the Brown Chapel, African American Episcopal Church. Two years later, the event that shaped the balance of her life occurred. While studying for her Ph.D., Dunham was informed by her mentors, Robert Redfield and Melville Herskovits, chairman of the department of African Studies at Northwestern University, that she had received both Rosenwald Foundation and Guggenheim Foundation grants to travel to the West Indies to do research in anthropology and primitive dance. Dunham received her Ph.D. in 1937. Her first book, Journey to Accompong (1946), was a result of her work in the West Indies. In it she relates the unending patience required before she was trusted to see the ritual ceremonies of the aborigines, dances that no outsider had witnessed before. About that experience she wrote, "My childhood in Juliet, Illinois, had equipped me with enough patience to outwait them." Dunham made her journey to the Caribbean to find evidence for her belief that the dances of American urban blacks, which she had witnessed in the '20s and '30s, had roots in the Caribbean and Africa, roots that were hidden through assimilation. She sought to find that connection and bring it to the world at large through dance. For more than half a century she did just that. While others labored to achieve technical perfection and virtuosity—George Balanchine, Martha Graham, and Doris Humphrey, for example—Dunham searched for and put the "soul" back into dance for African Americans and white modern dancers alike. Discipline and respect for technique are hallmarks of Dunham-trained dancers, but they apply those factors to a dance style that is creative, emotional, and immersed in the culture from which it comes. As an anthropologist, Dunham applied what she learned to the arts and changed the face of modern dance. It was she who, when asked how her students learned to dance "that way" replied, "It's a wonderful thing when people know why they dance." That response gave Dunham the label of "Controversial Pioneer." For most of her career, Dunham was at odds with both the dance world and, at least in her early career, with the African-American communit) In both instances it is easy to trace the cause. Always ahead of her time, Dunham attacked Modern Dance's "freedom of movement" style as a sham, noting that without purpose to dance, performers bring little but technique to the stage. Dunham's early lack of acceptance in the African-American community was more complex. While she worked to put soul and pride of origin into her choreography, others sought to abandon their historical roots and heritage by assimilating to the majority culture. She has long since come into her own, and the world followed. We can best honor the woman who left Joliet to become a citizen of the world by investing time to learn "why we dance." Hope Rajala was a long-time member of the Will County History Society, for which she contributed numerous articles to its Quarterly Publication. This article was prepared for that publication prior to her death on November 22, 2001. 1986 Awarded Samuel Scripps Prize, which honors dancers and choreographers who have made modern dance in American a universally recognized art form.